It is easy to miss Tjaden’s Electrical Service Shop, sandwiched between a chic restaurant and the Star Discount Store on Chatsworth Rd in Clapton, but I am on a mission. These days it is hard to find anyone trained in the art and craft of lamp repair and restoration, so I was delighted to discover such a place existed. Keith Tjaden’s shop, like an infirmary for injured lamps, a safe haven for ones like mine that have suffered rough times abroad, was just what I had been seeking. One evening last summer, I lugged in a batch of battered lamps that had travelled back and forth across the Atlantic with me, and were in need of conversion back to English ways and English voltage. Were they beyond hope of repair? I return to collect them in early autumn. The radio chunters away in the background as I gingerly push open the shop door. Mr Tjaden himself emerges from the back of the shop with an air of quiet triumph. My pair of skittle shaped lamps, sky blue and pale cream, were damaged on the sea crossing to America and consequently left standing unused in a basement for seven years, half converted, half broken, with the wrong plugs and flimsy cardboard fittings. Designated PIA. by the shop technicians – Previous Inexperienced Attention – they had cut a tatty and sorry sight. Restored to gleaming perfection, Mr Tjaden’s fine workmanship is evident in their transformation. Even so, he is swift to credit the original design and craftsmanship of the lamps, Made in England, for Heal’s – they benefit from good bones, at least, in spite of suffering from PIA. “The finish is so perfect,” he says, “that all I had to do was run the wax polish over the surface; they’ve not been sanded.” Apparently, it is all about the quality of the molding. The bases are made with powder-loaded resin, using an adhesive mixed with blue powder to get a solid base that won’t chip like a painted version. Mr Tjaden brings out my beloved pair of thirties lamps that he has restored for me: stacked up glass baubles on chrome cigarette tray bases that I found in a vintage shop in New York’s East Village. The glass baubles are cast, and therefore display no joint lines whatsoever, not something that I’d clocked till he points it out to me. Polished and sparkling, they are even prettier than when I first acquired them. The smart new flex is black. “We use it on almost everything because it matches everything – brass, wood, ceramics.” I learn that electrical flex has a dogged memory, so it retains its kinks and curves. Which is why cable coiling is such an art, flex refuses to repress its memories without a struggle. “Make sure the wire comes out from the inverted cigarette tray, so it doesn’t tip over,” Mr Tjaden tells me. Meticulous in his work, both aesthetically and technically, Mr Tjaden is very safety conscious and it dawns on me that I am lucky to have escaped with my life after seven years surrounded by such ill-converted lamp and light fittings while I lived in New York. “Despite the life they’ve had and the travelling they’ve done, they’ve been restored to new,” he says. He shows me the safety label he’s stuck to the newly refurbished base. I feel a glow of pleasure and relief. 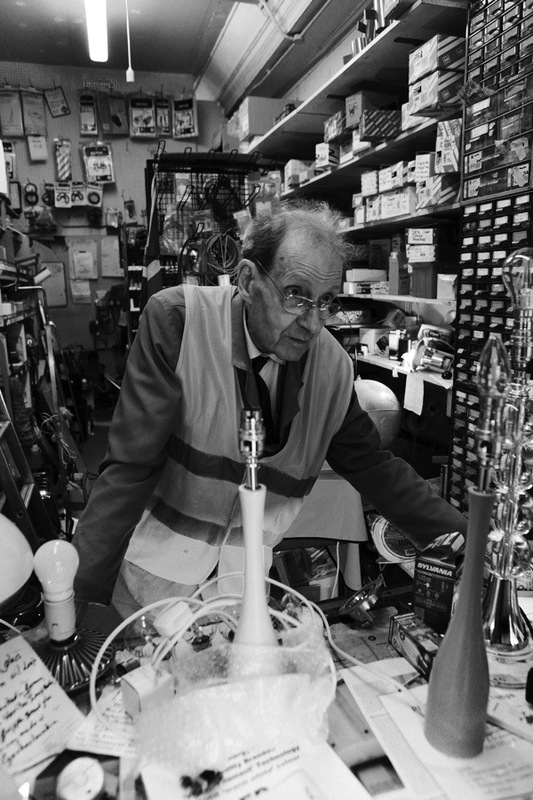 After doing national service in the RAF, working on navigational instruments, Mr Tjaden started the business in 1958 with his colleague and senior partner, Mervin, who had a background in TV and radio engineering. They took over the premises on Chatsworth Rd in 1990, moving here from Leystonstone High Rd, when the street was a still a bustling mix of greengrocers and washing machine repair shops, locksmiths and pet shops, carpet dealers and newsagents. Jim’s Café opposite has closed down now, after Dave the proprietor died. The place was a favourite lunch spot serving home made meat pies to all manner of people from the area. Road workers, who parked their barrows outside, sat beside men in suits and teachers who nipped out for a much needed break from Rushmore School up the road. Part of the shop’s appeal and longevity lies in Mr Tjaden’s ability to fuse the old and the new – he enthusiastically embraces change and modern technology, yet clearly retains an affection for antiques and vintage pieces. There is a pre-Weimar lamp being restored for a young barrister couple. A leather box from the twenties, a family piece, used for storing white wing collars, is on display. An old British microphone from the thirtie’s stands in the shadows in the back of the shop, waiting to be hired for a film or photo shoot. I spot a small gizmo I do not recognize sitting in a glass display cabinet. It is a 1945 radio valve, found inside old radios and radiograms, TVs and amplifiers. It has a heater that warms up the cathode which produces the electrons and comes out on the plate as a rectified signal. The radio valve, like the light bulb, is an endangered species. Nowadays all lamps repaired in the shop are fitted with the latest incarnation of LED bulb, lighting semi-conducted diode devices. “Filament bulbs or incandescent bulbs are strictly speaking off the market,” says Mr Tjaden, “unless they are extra long life or decorative. They waste energy and don’t produce much light.” I cannot argue with that, though I feel a pang of nostalgia. A typical LED bulb of a mere 4 watts, or 470 lumens, to use the newfangled measure, is rated to last 15,000 hours and provides ample light. The old bulbs are scorching to the touch, and burn out their fixtures. Their days are numbered, and not just because of European Union directives. There are some happy endings to the demise of the old bulbs. An elderly couple, barely able to discern the dimly-lit surroundings of their living room, were delighted when Mr Tjaden came to the rescue with a dazzling new LED bulb. A single pendant of 1,500 lumens. It did the trick. They will never have to mount a rickety chair to change a bulb again. “A god send,” Mr Tjaden says. And for a brief flicker, I picture the old couple, instant converts to the new illumination, gathered in the bright circle of light thrown by their thoroughly modern bulb. Fantastic to hear of such a specialist yet much needed service thriving. It’s a long way to Clapton but I do have a few old broken lamps packed away…. ouch! nice phrase, first encountered here. And I was hoping to see the ‘after’ photo of the described lamps. Gorgeous?! I bet! Yes indeed, those Reapair Shops will be the future! Linda, I think the lamps are in the foreground of the top picture, but colour may have been nice just for the lamps. 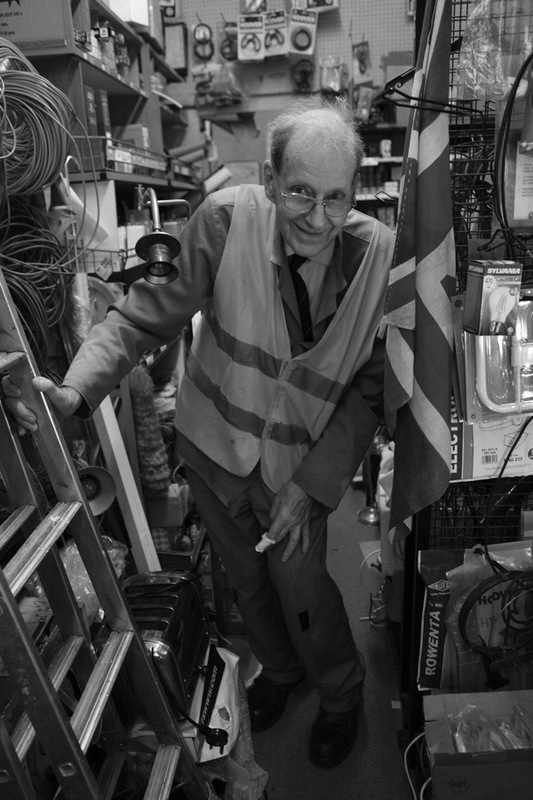 Black and white is so brilliant for a character such as this genius repair man! I must go to the shop sometime… I have ‘several’ rather old things that even I can’t repair! lovely! long may Mr Tjaden’s shop thrive. That was gorgeous.Thank you for writing such an interesting piece. Well done Mr. T, keep up the good work! I work for a locksmith and regularly surprise customers who just want to discard a lock for having no key or for not operating perfectly. I take pride in making a key (or two) and repairing these fine good old quality locks. He fixed a 1920′s swan neck lamp for us last year. I went in with a query about a faulty switch…and he took it away…sorted the switch, re-felted the base and polished the chrome plate…from only having sentimental value, it now looks a million dollars! When chatting with Keith, he let on that he used to work with very high end music recording equipment…but that there just isn’t the call for repairing and maintaining those large pre-digital bits of equipment anymore. Hope Tjaden’s Electrical is around for many years to come.